We recommend kneeling chairs for short-term tasks requiring forward reach or fine hand-manipulative tasks such as writing with pen and paper, eating at a table, and sewing. We discourage kneeling chairs for prolonged sitting, particularly if you are tall and cannot find a kneeling chair that accommodates your leg length. Kneeling chairs restrict navigation and movement around the work area, and for average-sized adults, produce unhealthy pressures on bent knees. This can restrict circulation and irritate the knee joints in some people. 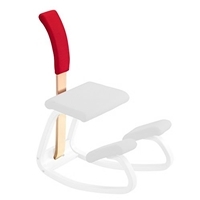 Rocking kneeling chair Thatsit Balans by Varier encourages constant movement and good posture. 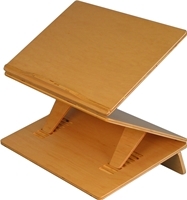 The Variable Balans wooden backrest provides additinal back support for people sitting extended periods of time. It also works as a stretching aid. Soft tape adheres to the underside of furniture rocker frames to protect delicate floor surfaces. Recommended for chairs that will be used on wood floors or other hard surfaces. The Variable Balans padded backrest provides additional, softer back support for people sitting extended periods of time. It also works as a stretching aid.